The Book Report - celebrating the great reads from old favorites to the best hot new writers. I mostly read fantasy, but let's face it--I love to read every genre and I only review what I love! 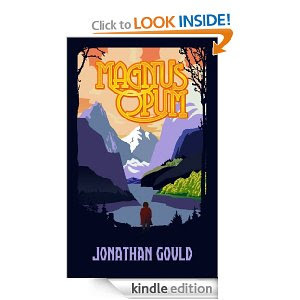 Today I am reviewing a fantasy, Magnus Opum published in 2012 by Aussie Jonathan Gould. I didn't know what to think when I began reading this book. It is a bit like Monty Python and Weird Al Yankovic meet J.R.R. Tolkien at a fraternity party and they all get really, really drunk and decide to write a book. Needless to say, while it is painfully funny at times, it kept me turning the pages. And I do mean PAINFUL at times, in the way Monty Python can be painful. But still we keep watching it and urging our friends to watch it too. First off, there is NO blurb for this book, only a list of complimentary comments from reviewers that I won't post here. I admit that put me off, but the cover art is wonderful, very reminiscent of the old Tolkien covers and I always buy a book for it's cover. Magnus Mandalora lives in the small, homely village of Lower Kertoob. Kertoobis are a bit ridiculous, and are quite given to celebrating the boredom of their regular, predictable lives. One day Magnus's brother Jangos is stricken with a terrible disease that occasionally strikes the residents of bucolic Kertoob--the Grompets. This is a terrible thing--it is a case of wanderlust in the highest magnitude. Magnus's brother goes out into the world to see the sights and for several months his letters home are filled with delight at what he has found. Then one day Jangos's letters simply stop arriving. Magnus's worst fears are realized when he is told by some wandering Doosies that his brother is dead, ambushed by a band of roving Glurgs. Glurgs are a race of vile creatures with violent tendencies and apparently have no redeeming qualities. All the histories of all the world's diverse people involve them being at war with them at some point. After all, anything that ugly and ill-mannered must be evil. Magnus is overcome with anger at his brother's death, and decides to do something very un-Kertoobish--he decides to go join the war against the Glurgs. Magnus meets a Cherine named Shaindor, a member of a race of people who are so beautiful it nearly hurts to look at them. Everything about them is beautiful, their art, their city, their faces. They have an army that is poised to go to war with the Glurgs and this is where Magnus's adventures really begin. The changes Magnus goes through as he discovers the reality behind his most cherished misconceptions and discovers the true beauty of the world he lives in makes for a wonderful adventure. Jonathan Gould's characters have a real life, even if it is one that is so obviously fantasy. While you are reading this tale, they will seem real, even if some of the scenery and creatures described make you say "hmmm...."
I enjoyed this free-for-all and reccomend it to anyone who likes a painfully good laugh. Magnus Opum is available at Amazon.com for the very reasonable price of $2.99. © 2019 Connie J. Jasperson All Rights Reserved. Simple theme. Powered by Blogger.